The Bangladesh Navy (BN) will configure two new-built Dornier 228-based maritime patrol aircraft (MPA) with the Leonardo Seaspray 5000E active electronically-scanned array (AESA) radar. 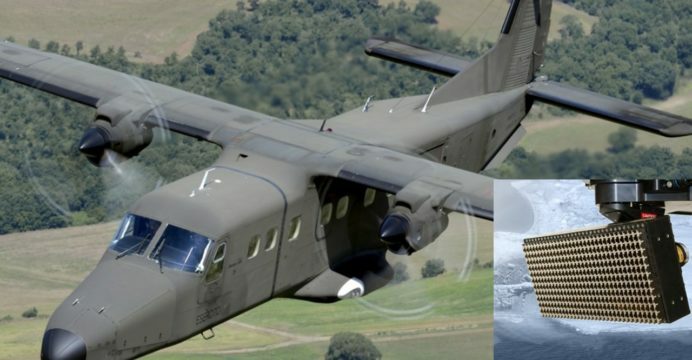 Leonardo says that the BN will use the Dornier 228 MPA to “monitor and protect Bangladesh’s 120,000 square kilometres of maritime territorial area and exclusive economic zone (EEZ).” Specific missions can include detecting “small targets in rough seas” for anti-smuggling operations, anti-pollution efforts and preventing illegal fishing. Leonardo will deliver the radars in 2018. The Seaspray 5000E belongs to the Seaspray AESA radar family of multi-mode surveillance radars, which have seen adoption by armed forces and law-enforcement agencies alike. In total, Leonardo has delivered more than 500 Seaspray radars. In South Asia, the Pakistan Navy is also adopting the Seaspray – specifically Seaspray 7300 – for its ATR-72 MPAs (Asian Military Review). Although an AESA radar (thus inheriting the electronic counter-countermeasures qualities of AESA radars), the Seaspray uses a commercially-off-the-shelf (COTS) processor. Leonardo positions the Seaspray as a cost-effective design with a “low cost of ownership”. The Seaspray also has a synthetic-aperture radar (SAR) mode for ground-mapping, this includes GMTI [Ground Moving Target Indicator]. In December 2016, the Bangladesh Navy had released a tender for two new-built anti-submarine warfare (ASW) helicopters to operate with the BNS Bangabandhu. The required specifications and munition-systems compatibility suggested that the Leonardo AW159 Wildcat was a strong frontrunner.